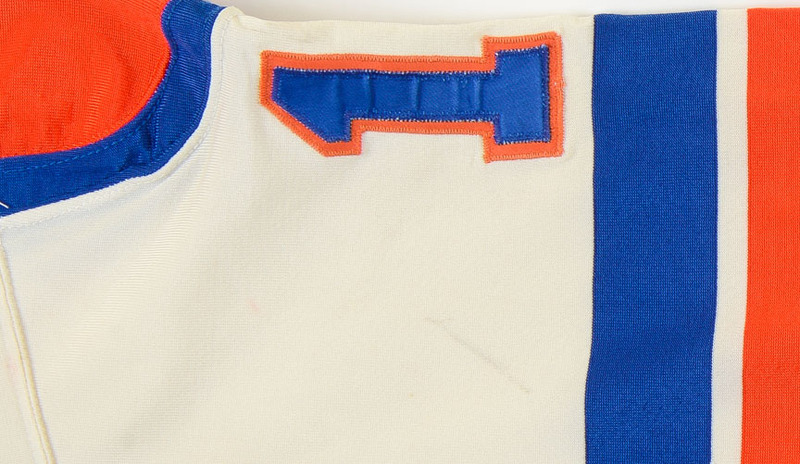 This home white dureen gamer by Cosby was worn by Craig Reichmuth during the 1972-73, 1973-74 and 1974-75 WHA seasons! This Manitoba born winger played a year of junior hockey with the Flin Flon Bombers before embarking on a decade long professional career. Craig traveled around the AHL, CHL and WHL before joining the upstart World Hockey Association for their inaugural season of 1972-73. Reichmuth spent his first two WHA seasons representing the New York Raiders, New York Golden Blades and the Jersey Knights. 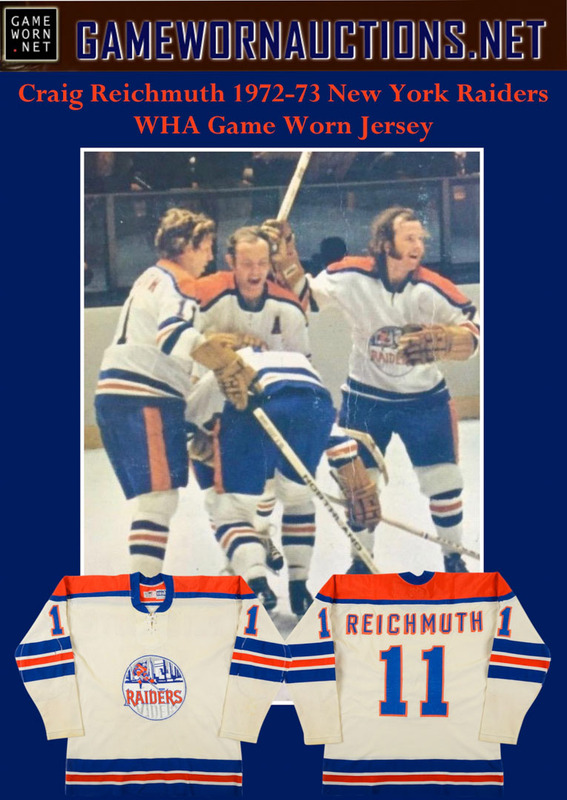 When the franchise relocated from New Jersey to San Diego, Reichmuth took the cross country trip and played part of the 1974-75 season with the San Diego Mariners before joining the Michigan Stags/Baltimore Blades franchise, his final WHA stop. Before Craig hung up the skates, he represented the NAHL’s Syracuse Blazers, Erie Blades and Johnstown Jets. Sadly, Craig passed away in 2012. Sewn into the collar of this gamer are the Cosby, wash and size tagging. The game wear on this sweater consists of stick and slash marks, board burns, board paint transfer, un-repaired burn holes, runs, fine inner pilling, team-sewn repair work to the belly and additional team-sewn repair work to the underside of the crest and the shoulder seam. As was the case with nearly all of the NY Raiders game jerseys, they accompanied the franchise to New Jersey and then west to San Diego, being recycled along the way from the Raiders to the Knights and then to the Mariners. This example shows the outline of the Knights crests a well as the individual lettering for San Diego that was applied on the diagonal. At some point in time after Craig left the Mariners during the 1974-75 season, the San Diego lettering was removed and an original Raiders crest reapplied. 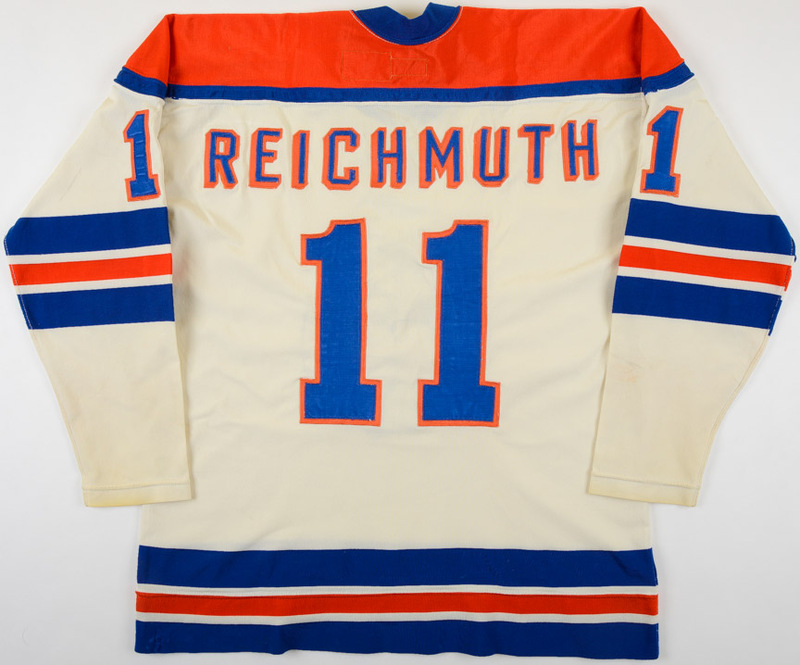 The lettering for the surname Reichmuth and the numbering on the sleeves and verso are all completely original, just as Reichmuth wore it in New York, New Jersey and San Diego. 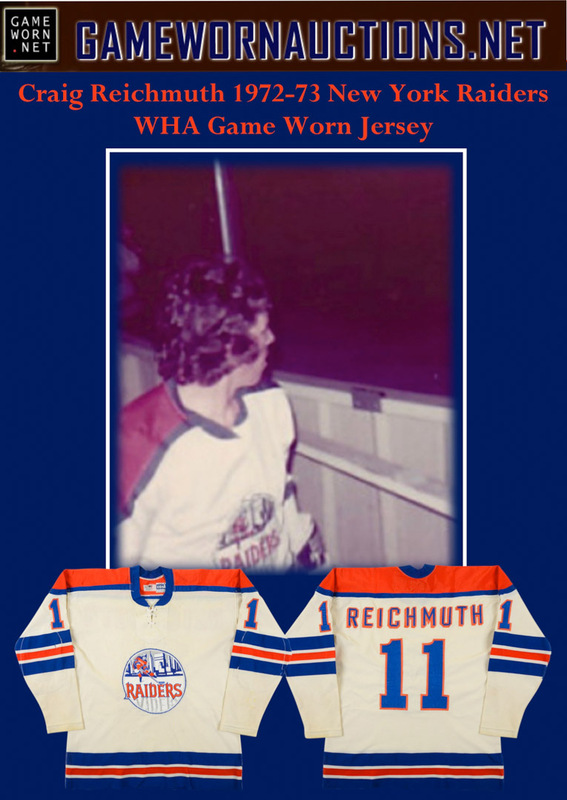 The cross-country journey that this gamer took speaks to the trials and tribulations that were the WHA, having been worn during the leagues first three seasons of play! Seldom few of these stunning examples have managed to survive the 45 years, let alone the trek they took from East Coast to West Coast. Unbelievably, the hockey hot beds of New York and New Jersey only supported the WHA for the leagues first two seasons, leaving their gamers always in high demand among collectors. 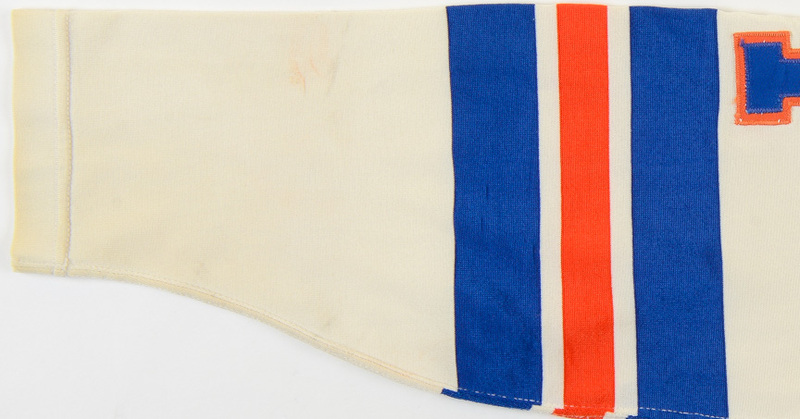 A tremendous piece of WHA history that would proudly represent any serious WHA collection, choice!